Recently, I had a custom scarf made for my sister to give to her for her birthday. She's one of those people who likes the super-long scarves like the ones Arnold Horshack used to wear on "Welcome Back, Kotter". Today I discovered a shop that has a bracelet that would perfectly match that scarf. You can see it pictured here in this post. Exact same shades of pink and brown, and that touch of white makes me think the bracelet should be named Neapolitan, after the ice cream. 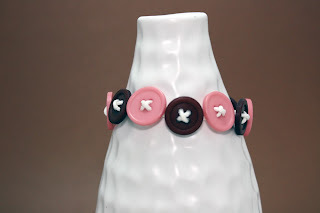 The shop where I found this bracelet is Just Peachy Jewelry and Accessories on Etsy. Based out of Orlando, Florida, this shop has a variety of button jewelry and other handmade bits and pieces from jewelry to hair accessories and even a cat in a tutu (you have to go by and take a look if only to see the cat, seriously). I'm especially intrigued by the crochet necklaces they have there. They're very interesting and I've been looking at them for a while wondering how in the world they managed to incorporate the beads into the weave. So take a minute to take a peek and a browse. 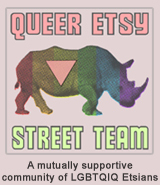 TO VISIT JUST PEACHY'S SHOP ON ETSY YOU CAN CLICK THE PICTURE ABOVE OR, IF YOU'D RATHER, CLICK RIGHT HERE! She does have a very cute shop! Lovely jewelry! Just Peachy's shop is so cute. I love the button jewelry! Such a fun shop with a nice variety of adorable items! ooooohhhhh, oooooohhhhh, oooohhhhhh love the cat in the tutu and the reference to Horshack. Haven't thought of that show in a while.